Year 5's have come to the end of their school year with us. We have LOVED teaching and supporting you and couldn't be more proud of you. We wish you every success and happiness in Year 6. Have a wonderful summer holiday. What a FANTASTIC week it's been! Those of us who went to Hooke Court had an AMAZING time! and we certainly were 'dynamic' throughout the range of activities that we participated in! A HUGE thank you to all our families that supported our Summer Fair. We all had a fantastic afternoon and lots of fun! Our Sports Day was a great success and, as always, our children competed with enthusiasm and determination whilst always demonstrating sportsmanship and teamwork. We've had another fantastic week and have been working really hard. In Maths we've been converting litres/millilitres, metres/kilometres and miles/kilometres. We filled various sized beakers with water and had to read the scale in order to identify how much water was in each beaker. We decided which measurement was the greatest and then had to prove it! 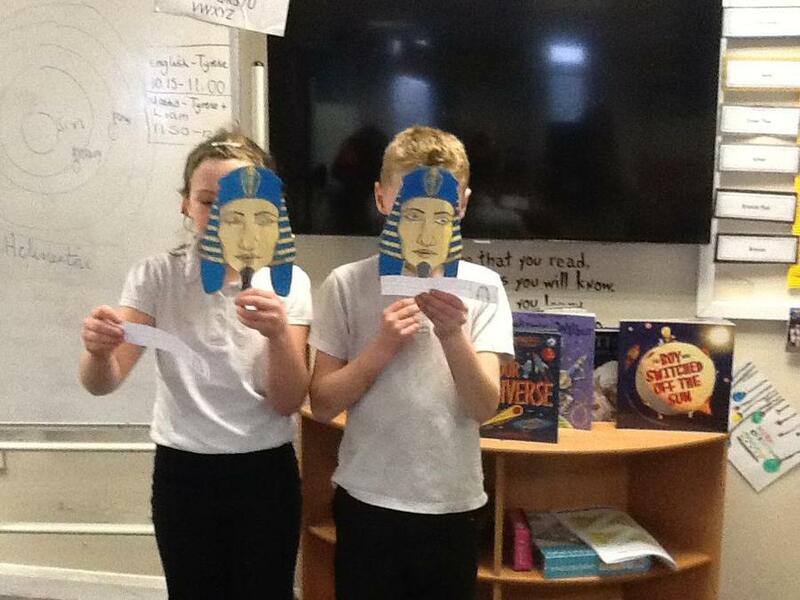 We have loved practising for the Year 5 Poem Presentation, which will be held this week. We are thrilled with how our presentation is coming along! We've all worked hard to learn the words of our chosen poem, we've brought in props from home to represent either the old man or the youth and our actions are AMAZING!! 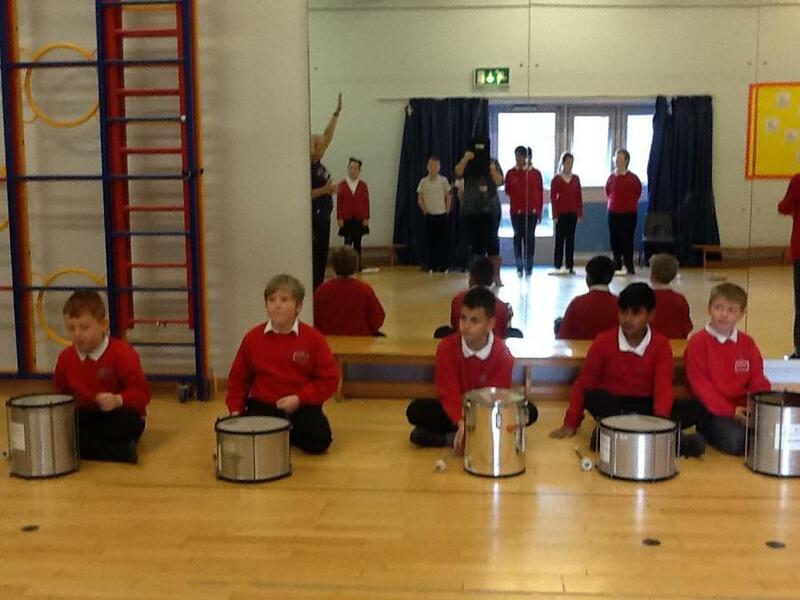 We can't wait to perform it to the school and to watch the other class performances too. We had a fantastic morning on Wednesday when three representatives from IntoUniversity, Lauren, James and Nicky, came to talk to us. They were incredibly impressed with our listening skills, our enthusiasm, teamwork, maturity, motivation and focus. We learnt all about what a University is and what goes on there. It made us think hard about our futures and the opportunities that are available to us. Do you know how many subjects are available to study at University? Some of us guessed that it could be 2, or maybe 10. Others estimated that it could be 50 or even 250. We were astounded to discover that there are 50,000 courses available!! It was so interesting to learn more about some of the courses and what University life is like. A HUGE THANK YOU to Lauren, Nicky and James for a fantastic morning! It's been very hot and beautifully sunny this week! We had our last PE lesson with Mr Purnell, from Hans Price, on Monday. We've all learnt so much and have thoroughly enjoyed further developing our PE skills. With Sports Day approaching, we've been practising our race skills too. We are very proud of the parachutes we designed and made this week. We know what gravity is and we have also discussed what air resistance is. Would you be able to explain how a parachute works? We carefully recorded how long each of our group's parachutes remained in the air! It's been another exciting and very busy week. In English we've been using our amazing imaginations to write descriptively about waking in a storm and writing dialogue. We are very good at remember all the appropriate punctuation we need to use! In SPAG we've considered active and passive speech and have written in three tenses - past, present and future progressive. We are so clever! 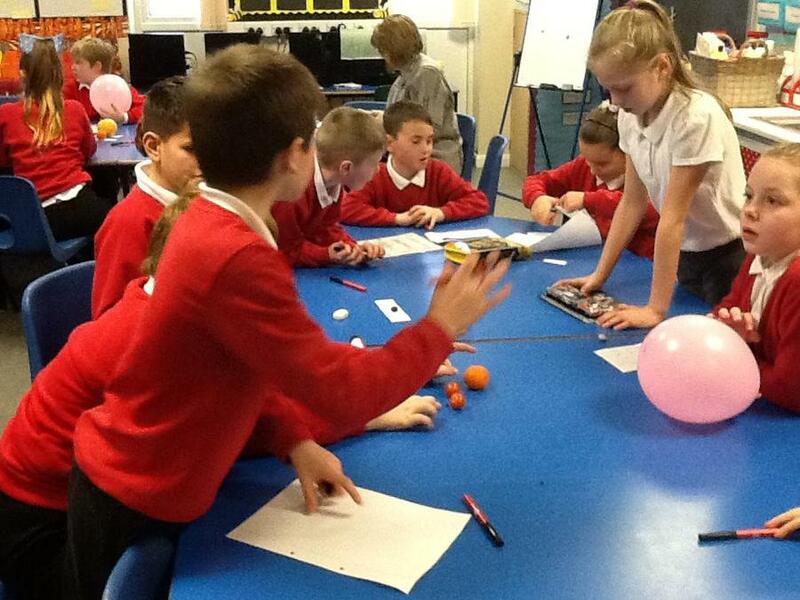 We've had great fun this week exploring 3D shapes and their properties. We've used co-ordinates to translate shapes to a new grid and have drawn and reflected shapes in its mirror line. Some of us followed a set of instructions to draw and reflect a shape and then we wrote a set of rules explaining how to reflect a shape. Having designed and made fascinating memory games, we voted on which three games we should take to Wednesday's Science Fair. A big 'thank you' to all of our families who came and supported the event. We all had lots of fun! It was a very active day, which ended with an afternoon of sports. We were so fortunate that the weather was warm and sunny... what a BRILLIANT day! Gym PE lesson this week! Phew... it's a long way! Beads, Good Deeds and Rangoli Patterns. We are really looking forward to our trip to Weston Football Club on Friday, which is linked to our Enquiry Work and considers how people change as they become older. We are going to be watching, and then playing, Walking Football. It will be so interesting for us to be taught how to play the game by older people. We appreciate that the older generation have many years life experience to share with those of us who are younger. We are really excited about it! This is our last term in Year 5! We hope you all had a fabulous Half Term holiday. In English this week we have started a brilliant new class book called, The Matchbox Diary,which is written by Paul Fleischman. It is a fascinating story where a great-grandfather encourages his great-granddaughter to choose a matchbox from his collection. Each matchbox contains a precious treasure. "Pick whatever you like the most," says the elderly gentleman, "then I'll tell you its story." We love the illustrations in the book and have learnt about immigration. 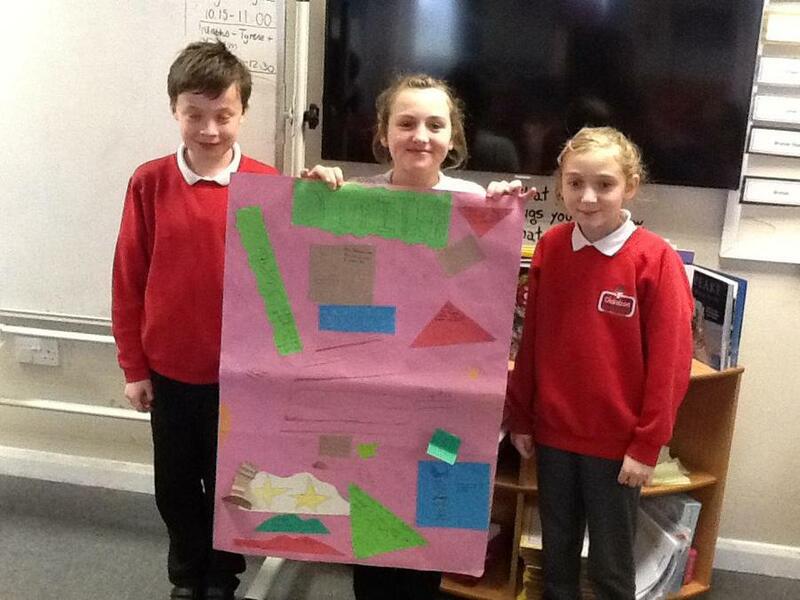 In Maths this week we have consolidated our knowledge of fractions, decimals and percentages. We've also revised long multiplication and have identified properties of regular and irregular polygons. We all really enjoyed learning our times tables by using a counting stick, it was fun! We are brilliant netball players! Bex is extremely impressed with our progress in PE! We can't believe that it's the last week of Term 5! 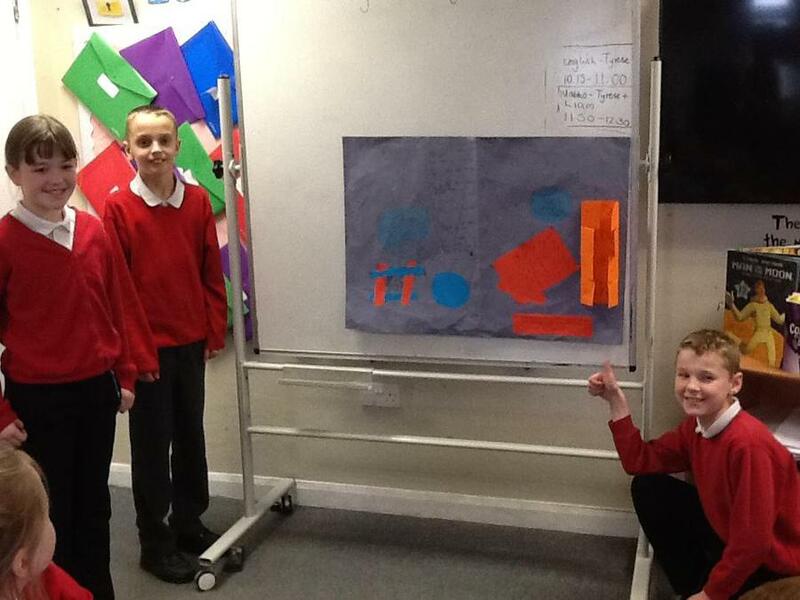 Look at the fantastic photos of the posters that we created and presented. It makes us all so incredibly proud when we look at our Topic Wall and celebrate all of the amazing work that we've done this term. Have a fantastic Half Term... keep safe and have fun! Year 6 who have completed their SATS this week. This week in English we've been planning and preparing for our adventure stories that we are going to be writing. We've designed and described a disaster setting for our story, designed and created our main character profile and have drawn a mind map that considers a variety of problems that our stories may include. Some of our ideas were very dramatic indeed! In Maths we have been converting between percentages and fractions, paying particular attention to finding 50%, 25%, 75% and 10% of amounts of money. We've progressed to finding multiples of 10%, 5% and 1% too. Our one and two step word problems have challenged us to really think about the methods we've used. 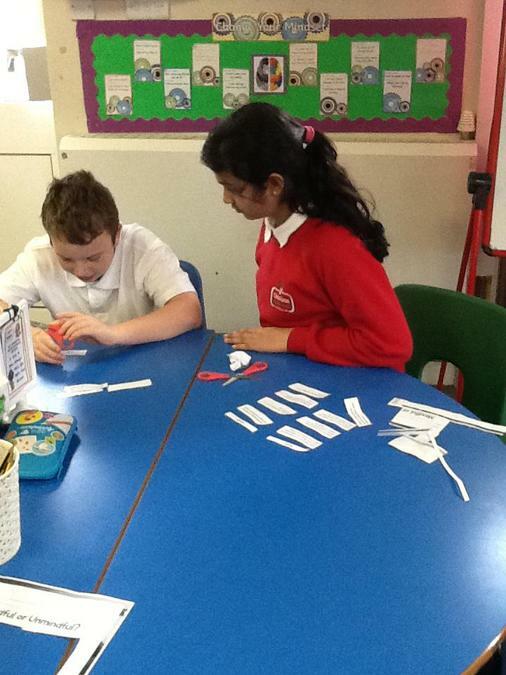 In RE this week we have investigated and sensitively discussed the spiritual goal of a Hindu. We can explain what 'Moksha' is and what the cycle of birth and re-birth, for Hindus, looks like. We ALL appreciate the importance of staying safe online. We all thoroughly enjoyed the long, sunny Bank Holiday weekend! 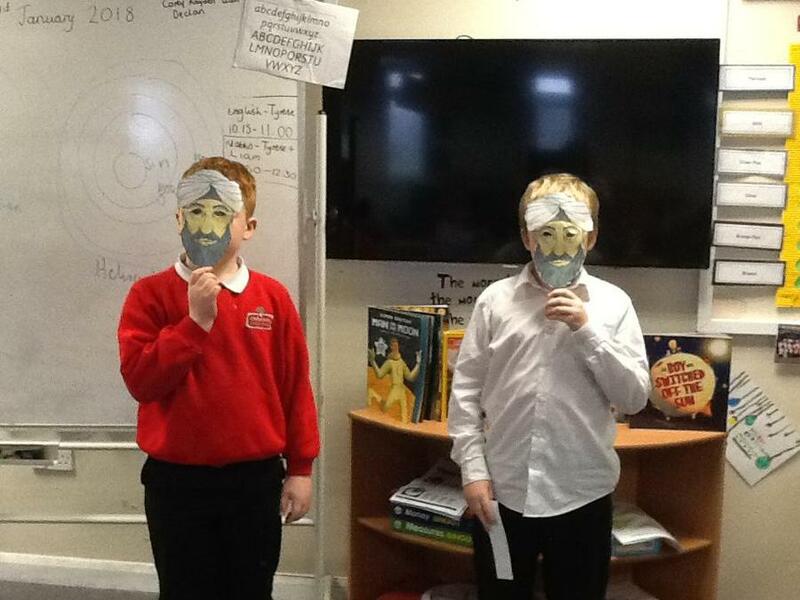 We have been working very hard and in English this week we have written a dialogue between Michael and the strange man, Kensuke, who appears to have inhabited the desert island for quite a long time. We are looking forward to finding out more about him. Michael was devastated when he was unable to get the attention of a ship that he spotted on the horizon. We wrote emotively about how Michael would have been feeling at that time. We've also been practising our comprehension skills and we love our Hooks for Books lessons! In Maths this week we've been converting between percentages and fractions and we have been finding percentages of amounts. Following on from our NSPCC assembly recently, we were thrilled and extremely proud of the amazing sum of money that was raised from the sponsorship from our Colour Run. Our guest visitor, who represented the NSPCC and Childline, explained how our sponsorship money will help lots of families in the future. We would all like to thank our Oldmixon families and friends for sponsoring us and helping to raise this fantastic sum of money. Wow! Week 4... We can't believe how quickly this term is going! We are continuing to thoroughly enjoy our class book, Kensuke's Kingdom written by Michael Morpurgo. The main character, Michael, and his beloved dog, Stella, have fallen overboard the Peggy Sue and have been washed ashore a deserted area of land. Michael Morpurgo is incredibley gifted at building suspense in his writing and we have been practising this in ourEnglish lessons this week. We've also been writing descriptively about Michael as he goes overboard and about the desert island that he finds himself on. Please ask your child how we use our 1, 2, 3, 4, recipe to create AMAZING sentences of the highest quality! Michael Morpurgo would be impressed! During our Maths lessons this week we have been converting fractions to decimals and have been making conversions between percentages and fractions. We now understand how Fractions, Decimals and Percentages are linked. We are all really enjoying our PE lessons, particularly when we can go outside in this beautiful sunshine. Our Rounders game this week was very exciting and extremely energetic! During our RE lesson this week we have been sensitively considering what we believe happens when someone dies. We drew a mind map to record our thoughts. We then discussed how Hindus may live their lives as they believe that they will be re-born. Several of us bought delicious Slush Drinks that our Year 3 class made this week... thank you Year 3! We are all thoroughly enjoying this term's Topic... Extreme Earth. We have discussed the impacts of drought and have considered the Economic (cost to people and business), Environmental(plants, animals and the Earth) and Social (people's health and safety) impacts that can be devastating. During our English and SPAG lessons this week we have been perfecting our speech punctuation and ensuring that our work contains compound and complex sentences. We've also written a diary entry from Michael's perspective about how he and his family spent Christmas Day on their boat... they didn't have roast turkey and all the trimmings, that's for sure! We were extremely proud of the amazing Water Cycle Poems that we wrote. Continuing our fraction work in Maths we have been recognising equivalent fractions and exploring the relationship between fractions and decimals. We can show our fractions in their simplest form and are beginning to convert fractions to decimals. What an incredibly exciting week we've had! which are due to erupt on Friday!! We are all thoroughly enjoying our new class book, Kensuke's Kingdom, by Michael Morpurgo. The main character is Michael who, along with his family, sets off on an adventure of a lifetime!Incredibly, Michael becomes washed up on a desert island and struggles to survive on his own. Who could have placed a plate of fish, the fruit and a bowl of fresh water beside him? In English this week we have discussed, and written, a balanced argument about whether Michael's family should have set off on their adventure to sail around the world. We've written a diary entry from Michael's perspective from the day he left for the trip, and we have written postcards from Michael to his friend, Eddie Dodds. Continuing with our fraction work in Maths, we have been adding, subtracting and multiplying fractions. We can simplify fractions and find equivalent fractions. Phew! We had no idea that there is so much to learn about fractions but we are becoming increasingly confident in answering the questions. During RE this week we've been considering Hindus beliefs on Karma and Samsara. We've thought about how both positive and negative Karma can affect lives. Continuing our work on relationships in our Jigsaw lesson this week, we've discussed the meaning of friendship, how we manage our friendships and why they are so important throughout our lives. We hope you all had a wonderful Easter holiday and a restful break. Myers College, Chakwal, North Punjab in Pakistan. We are absolutely thrilled to each have our own Pen Pal. It was so interesting to read about our Pen Pal's school life and home life in Pakistan. During our English lessons this week we have planned, edited and published our replies to our Pen Pals. "I was excited to know that I have a Pen Pal from another country. My Pen Pal is called, Amna. She is 11 years old and is in Year 6. Her hobbies are badminton, gardening and reading. I enjoyed writing my letter to her and have told her all about myself." "I felt nervous when I read my Pen Pal letter because I didn't know if they would write to me in English or not. I was so excited to read my letter. My Pen Pal is called Amnah Nasir and she's 10 years old. She has 4 sisters and 1 brother and she likes Chinese food." "My Pen Pal is a boy called Abdul-Hadi and he is 10 years old. His favourite colour is red and he has dark black hair and dark eyes." In English this week we have written another newspaper report for the Victorian Times. This report concerned the missing convicts that are characters in the Charles Dickens book, Great Expectations. We also wrote some amazing descriptive writing about the abandoned wedding feast from the book. You would definitely NOT have enjoyed this wedding reception! Please ask your child to tell you why! We've also written advertisements and needed to remember to use persuasive language, rhetorical questions, alliteration and exaggerated adjectives. Continuing with our fraction work in Maths, we have been ordering fractions, solving fraction word problems and converting mixed numbers to improper fractions. Very good advice Year 5! During our RE lesson this week we have been considering and discussing what kinds of people have had a strong purpose or sense of destiny. We looked specifically at Florence Nightingale and Queen Elizabeth II and discussed whether they had planned their lives, or whether their lives were pre-destined. We were so excited to make our brilliant bridges from the designs that we'd worked so hard on last week. They were all pretty spectacular! We completed an evaluation and considered whether our finished bridges were the same as our original design, and if they weren't then how did they differ and why? Some of us made some delicious Easter biscuits, which we sold during our Easter Fayre on Thursday afternoon. Lots of families enjoyed decorating them... and then eating them! A huge thank you to all of our families who came along to support our 'eggcellent' Easter Fayre! We all had an 'eggstremely' good time and hope you did too! Year 5 have, yet again, worked very hard this term. They've produced some beautiful pieces of work and their mature and focussed approach to all aspects of their learning is brilliant. HAVE A FANTASTIC EASTER HOLIDAY! In English this week we planned and wrote either a diary entry or a story. We took our inspiration from an interesting picture of a grasshopper, a slug, the moon and a ladder! We all came up with our own ideas and wrote some extremely varied and interesting pieces of work. Having read part of the Charles Dickens book entitled Great Expectations, we wrote a diary entry of the day that the character, Pip, visited the graveyard. The Victorian setting book, Queen Victoria's Bathing Machine is a very funny book and the illustrations are brilliant! Continuing with our fraction work in Maths we can recognise equivalent fractions. We can label fractions on a number line and write an equivalent fraction for it. We can also use common factors to simplify fractions. We are certainly becoming fraction experts! 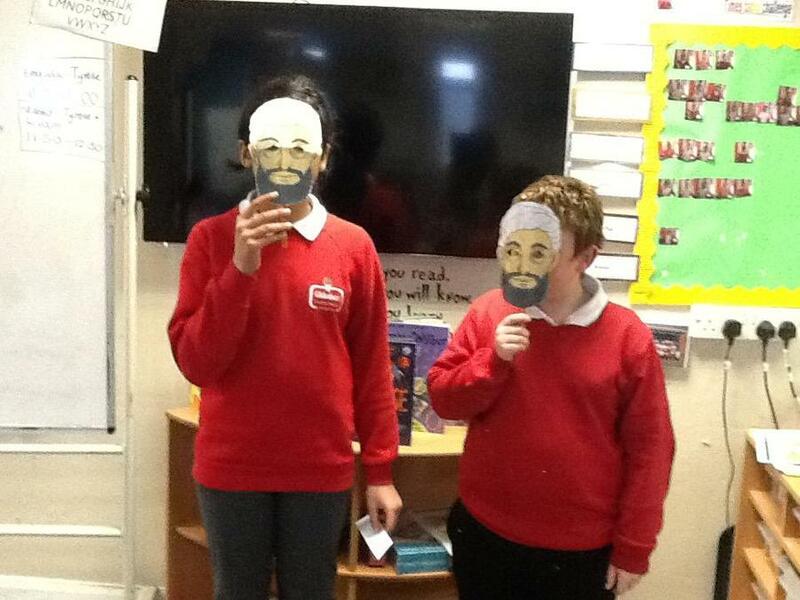 In RE this week we re-capped the events of the Easter Story and discussed Jesus's crucifixion. Who would you choose? Who do you admire? Continuing with our topic work we researched different types of bridges and discovered that there are four main types of bridge: Suspension, Arch, Beam and Truss. Taking our inspiration from the famous engineer, Isambard Kingdom Brunel, who built bridges, tunnels, railways, docks and ships, we designed our own bridges... they were absolutely amazing! We will soon be making the bridges that we've designed and came up will a list of resources that we will need. Maybe there is another incredible engineer right here in Year 5 who will become as famous as Isambard Kingdom Brunel. We all enjoyed our 'snow days' last week and now we are back at school and ready to learn! In English this week we've written formal letters to Mr Brownlow and have written our own alternative endings to the story of Oliver Twist. We let our imaginations run free and produced some amazing work! We can use hyphens for compound adjectives and have perfected direct speech punctuation. Having written book reviews on Oliver Twist, we considered whether we would recommend this book or not. Most of us really enjoyed it and would definitely recommend this book to others. We have also looked at another book written by the Victorian author, Charles Dickens. The second book is entitled David Copperfield. We looked for comparisons between the two books and there were quite a few. Are you unsure what homophone words are? Don't despair... just ask one of our children - they are experts! In Maths we have continued to find fractions of amounts and have considered which fraction of an amount of money we would prefer to have. We've explored a fraction wall and have used it to help us to compare fractions. Our Mental Maths skills are definitely improving too! We continue to really enjoy our fantastic gym lessons in PE and have learnt so much! Some of us are continuing our swimming lessons on Thursdays and the rest of us are becoming extremely proficient in our yoga lessons. We use our knowledge and understanding of the benefits of mindfulness and rhythmic deep breathing to benefit fully from our yoga sessions. Continuing with our Victorian enquiry work, we have learnt about Victorian Inventions and produced beautiful pieces of work. We wrote fantastic newspaper articles for the Victorian Times and have researched the British Empire. During our RE lesson we discussed whether we believe that Jesus is the son of God. We also considered how Jesus may have felt physically and emotionally when he was crucified and created a mind map to illustrate our thoughts. In our Jigsaw lesson we discussed potential emergency situations that we could face in our lives and created a storyboard to reflect this. Phew! That's a lot of work to have completed in one week! We are a very special class and never fail to amaze our adults! BBBBrrrrrrrrrrr... It's been very cold this week, with the promise of snow! In English this week we have been continuing with our class book, Oliver Twist. We've considered whether Oliver should run away with Dodger or not. We have written balanced arguments and have given our reasons as to whether Oliver should go, or stay. In Maths we have been exploring fractions. We can find fractions of shapes and colour them accordingly. We've used bar models to help us find fractions of numbers too. A secure knowledge of our times tables really helps us! "I love Brain Break, it helps me relax and gets me ready for our next lesson." "During Brain Break I imagine that I can hear trickling water in a rainforest." "I feel like I'm floating in the air and resting my head on a fluffy cloud." "When we do Brain Break it's so quiet I can hear birds tweeting in the trees." Please ask your child about Mindfulness and Brain Break. Year 5 are experts and can tell you all about it! Welcome back to Term 4, we hope you all had a wonderful half term holiday. We are very excited about our new topic this term... The Victorians. There is so much to learn! We know that Charles Dickens is a very famous author, who lived during Victorian Times. He wrote many books and we have really enjoyed reading Oliver Twist. During English this week we have written character descriptions of Mr Bumble. What a character he was! We've generated dialogue between Oliver and Mr Bumble and have worked extremely hard to perfect our speech punctuation. "If you want to fulfil a desperate feeling in your stomach and be Queen Victoria herself, follow these instructions to make a delicate, delicious, mouthwatering cake." Wow! That introduction would motivate anyone to bake a Victoria Sponge! We produced outstanding posters which depicted Queen Victoria's family tree. They were colourful and informative. Do you know how many children Queen Victoria had? It's quite a lot! Ask your child and they'll be able to tell you. during Maths this week, we have rounded decimal numbers to the nearest whole number. We can add and subtract whole numbers to decimal numbers. We are amazing! We have thoroughly enjoyed our new Sports Coach lessons for PE. We are learning Gymnastics this term. We have had a very busy week! 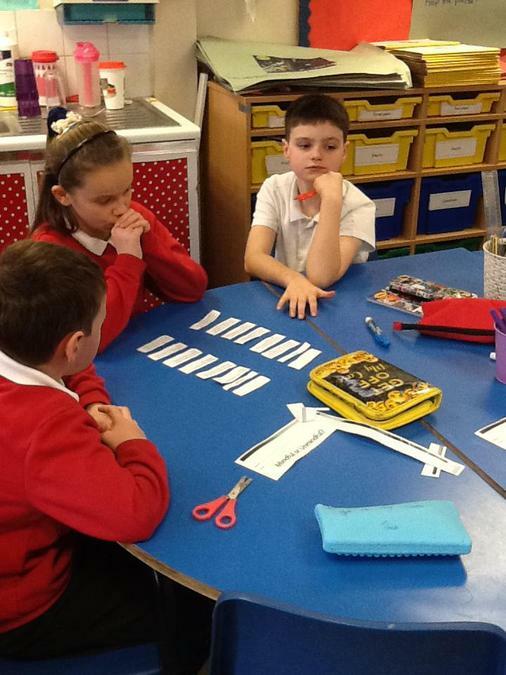 In English, we wrote balanced arguments and had to carefully consider our 'for' and 'against points. We wrote some amazing descriptive writing about the planet, Pluto. We have written playscripts and we remembered to set the scene, incorporate stage direction and use appropriate punctuation. 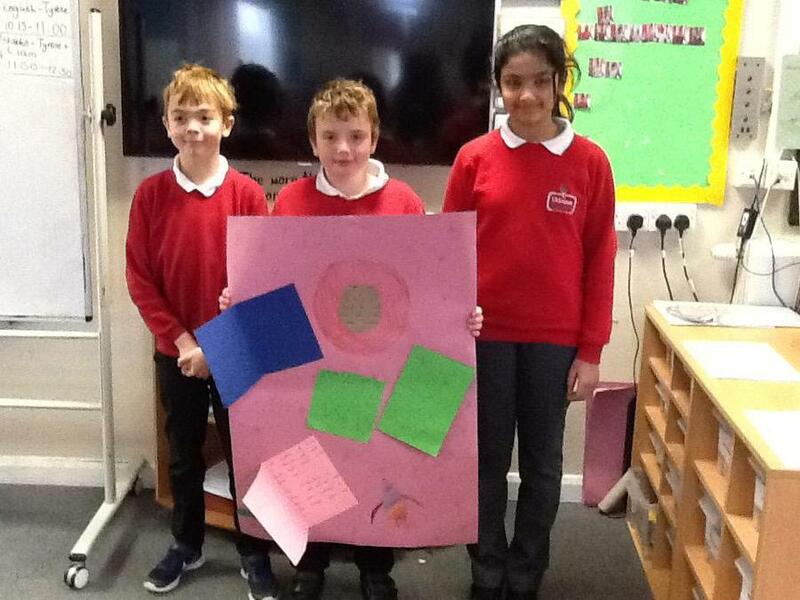 We created innovative news reports on 'The Super Moon' in our teams. We are brilliant mathematicians! We can identify and measure reflex angles, draw acute angles accurately and identify missing angles in a shape. Have you ever made a sundial? We have! They worked perfectly and enabled us to tell the time whilst we were outside. We loved dressing up with clothes with numbers on them for Number Day. We designed rockets and calculated their area and perimeter. In English this week we have been writing formal letters. We've also been studying the British astronaut, Tim Peake. We've researched his life, which has enabled us to write fascinating biographies about him. For Internet Safety Day we discussed and learnt how to keep ourselves safe when using the internet. We wrote a recipe and a set of instructions to remind us how to keep ourselves perfectly safe. 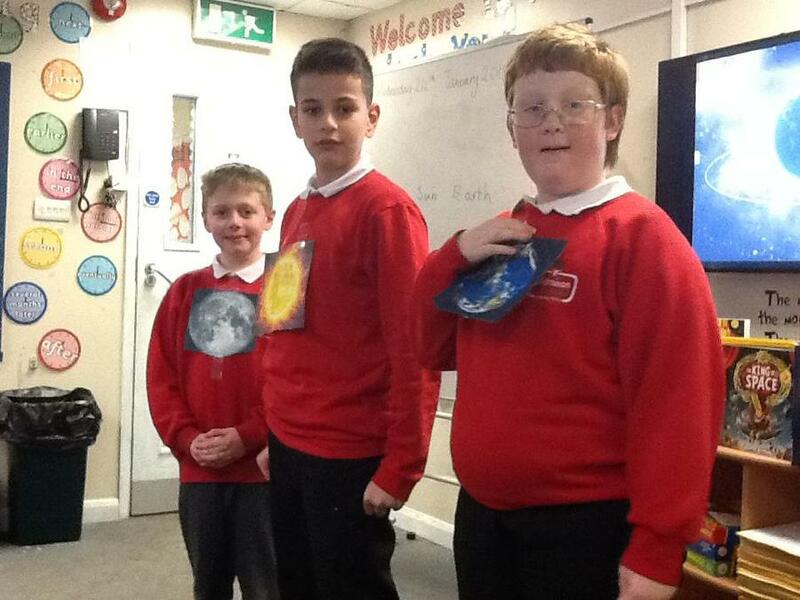 In our teams, we delivered our planet presentations. We were all thrilled with how they turned out ... they really were amazing! We voted on the best one and the winner was.....EARTH. A HUGE thank you to all our lovely parents, carers and family members who came into our classroom to look at our Enquiry Books and share all of the amazing work that we have done this term. We all enjoyed making our star constellations with marshmallows and cocktail sticks! We enjoyed eating them even more!! 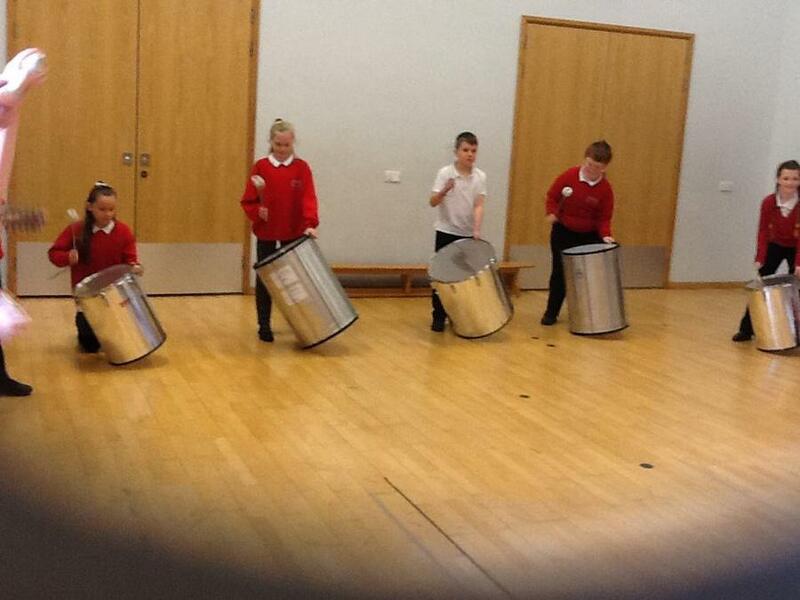 This week we had great fun in our Brazilian Samba Workshop! "We were each given instruments and we learnt how to keep a rhythm. 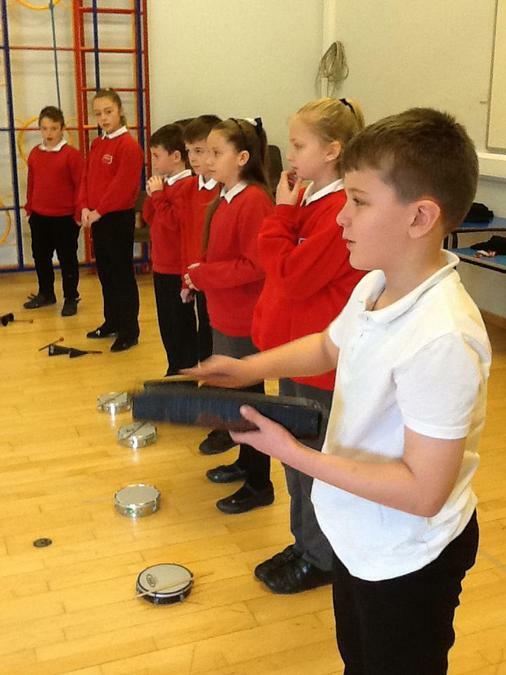 It was so good to be able to have the chance to try lots of different instruments. The small drum was my favourite." "It was good fun because we played instruments that we hadn't seen before. We played amazing tunes!" In enquiry this week we have looked at the geocentric and heliocentric model. We discovered that the sun is at the centre of the solar system. Welcome back from the Christmas holidays. We hope you've had a wonderful time and we wish you a very Happy New Year! 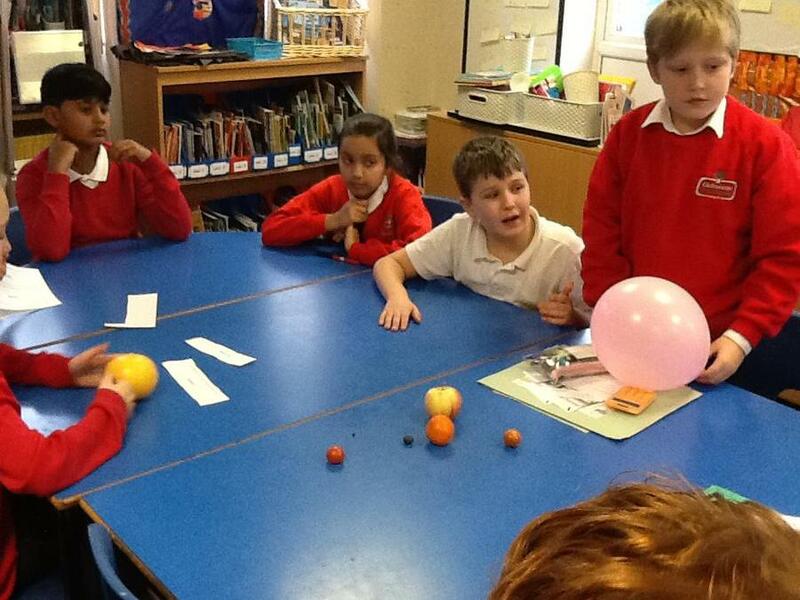 We have been learning about the Solar System and we used different fruits to represent each planet. The balloon represented the sun! 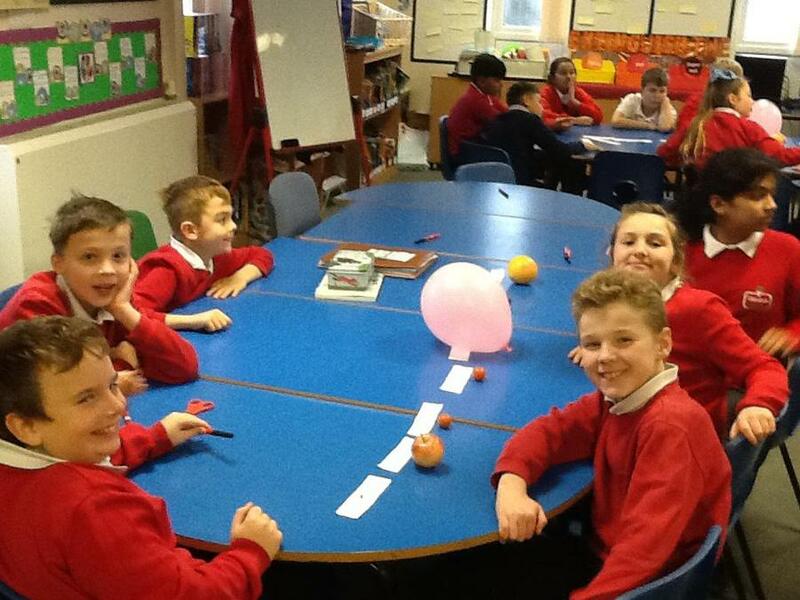 We made up our own sentences to help us to remember the order of the planets. Mysterious Vikings Eat Marsbars Jumping Slowly Under Nappies. My Very Excellent Moustache Just Saw Us Napping. We've also been learning about our brains and how they work. We know that there are three main parts to our brain. The Prefrontal Cortex, Hippocampus and the Amygdala. 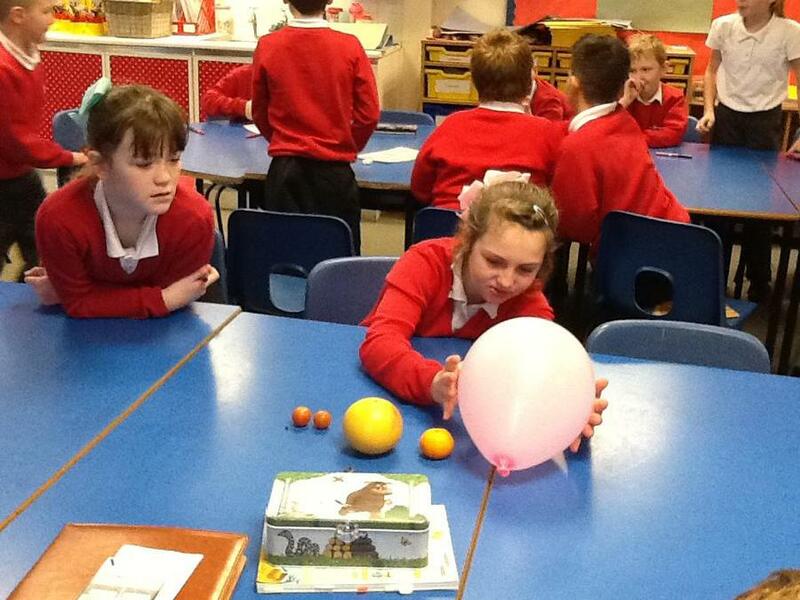 We have been investigating what functions each part of our brains have. We've started reading our new class book, which is called Cosmic, written by Frank Cottrell-Boyce. The main character is Liam Digby, who went to a theme park and accidentally ended up in Space! We think it's going to be a very exciting book. In maths we have learnt how to multiply 4 and 5 digit numbers by 2 digit numbers. We have been exploring mindful and unmindful behaviours and discussing them in our groups. We have also investigated as to whether the Earth is flat or spherical. We are thoroughly enjoying the exciting book, The King of Space, written by Jonny Duddle. The main character is called Rex... he may be small, but he has BIG plans that will take him to the furthest reaches of Space! This book has inspired us in English to write a character description of Rex and to imagine that we are Rex and to describe how we will each become the King of Space! 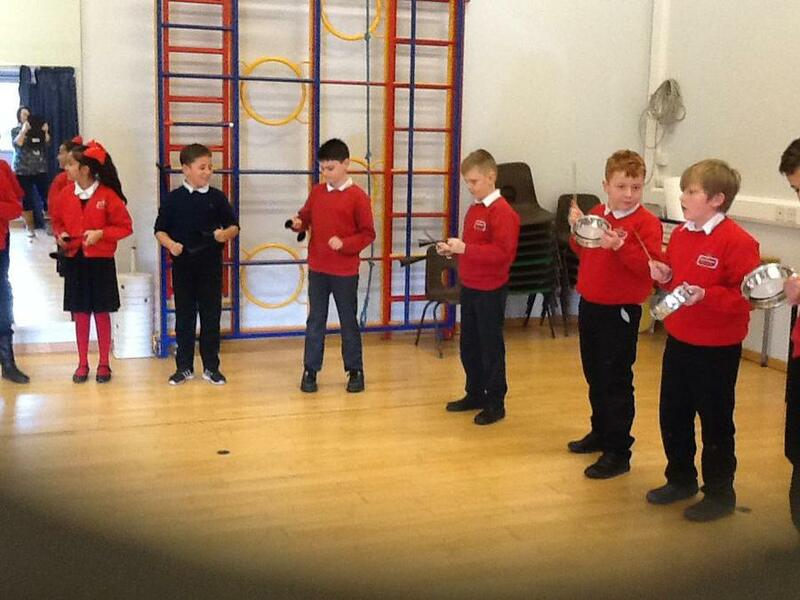 We've also designed our own robots and considered their special powers. We've also written newspaper articles reporting on the kidnapping of Princess Kooki!. 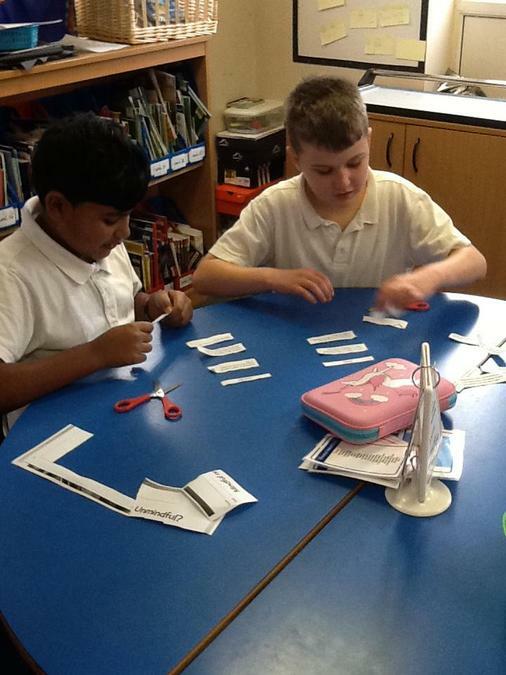 In maths we have been learning how to divide 3 and 4 digit numbers by 1 digit numbers. It's imperative that we're confident with our times tables! Welcome back! This week, we have begun a new topic and we have planned an exciting WOW day for next week! As part of our enquiry learning, we have explored the outbreak of war and looked at the countries that were allies to Great Britain and those that were axis. In English, we have been reading 'The Lion and the Unicorn'. We have written setting descriptions, a letter and predicted what will happen next as part of our Book Power Hour! On Monday, we had our WOW day! We dressed up as World War 2 evacuees and took part in a range of exciting activities including making identity cards and gas mask boxes, baking honey cakes and experienced what it would be like when the air raid siren sounded in school. It is anti-bullying week, so we have written some anti-bullying poems! We have also created Blitz skyline pictures using paint and black card. This week we had a mindfulness day. Activities we did included yoga, drama, board games and team games! This week, we have been doing lots of activities linked to the book, 'Only One You'. We have designed and painted pebbles inspired by the book, written autobiographies, written recipes for a good friend and worked in teams to complete maths challenges! What a fantastic two weeks we have had in our new class. This week we have been learning about place value in Maths and setting descriptions in English. We have also had a great time at forest school this week, making pictures out of leaves to make it look like the forest. We also went swimming at Hutton Moor which was such good fun. For maths this week we have been rounding numbers to 100,000. In English we have been writing descriptions about a North American setting and for P.E. we have been playing tag rugby. Wow! What a fantastic Big Day Out we have had today! We built sand sculptures, did some sports,in a round robin, and watched the balloon man. The balloon man was amazing, he made some one into a bee with balloons and even climbed inside a great big balloon. he ending of the story. We have been doing subtraction in maths using a number line and designing our own Totem Poles in art.